When you have unsealed interlocking pavers you run the risk of fading, staining and dirt buildup. pristine condition for years to come. By using a quality sealer for your interlocking pavers you can protect your brick and other types of paver materials. It will also preserve your desired appearance for the pavers. Utilizing the appropriate type of sealer will help to maintain the new appearance of your pavers for years to come. If you have just placed new brick or concrete pavers, then you should wait at least 30 days before applying a paver sealer or follow the manufacturer’s recommendations. When you are ready to move forward with the sealing process be aware that the surface needs to be washed with efflorescence cleaner prior to the application of the sealer. 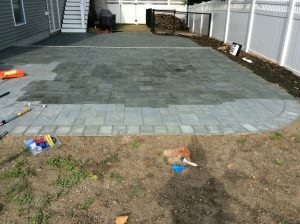 You will want to ensure that all dirt, sand, oil, and grease are removed fromyour pavers before moving forward. When you have completed the cleaning process, remove all moisture from the pavers as the surface must be dried prior to applying the sealer. Allow for 24 hours for any moisture to dry if necessary. If you are experiencing cooler temperatures you may need to allow for up to 48 hours for the pavers to be completely dry. Before you start the sealing process, be aware that appropriate weather is needed. Weather must be dry, below 85º F, and with no rain for at least 48 hrs. after applying the sealer. The most common types of sealer are water based, solvent based and hybrid based. Apply your sealer to your interlocking pavers or bricks with a compressed air pump sprayer. You will want to apply a heavily saturated coat of your sealer and use a generous amount to soak into the dry sand between your pavers. You can use a paint roller to maneuver any excess sealer into your sand joints to avoid puddles from forming on the paver’s surface. Approximately 2 hours after applying the sealer, you can apply an optional second coat if desired. Sealer finishes are wet and dry look. After your final coat is applied, prevent any foot traffic on the pavers for at least 2 hours. You’ll also want to make sure there is no heavy traffic on them for up to 48 hours. If your pavers are used for a driveway, prevent vehicle traffic on them for 72 hours in order to give the sealer time to settle. Your interlocking pavers sealer will need periodic maintenance in order to preserve its color and shine.Perform occasional cleanings as needed with a pressure washer to prevent dirt, grease or loose soil. If you happen to have any questions concerning the application of Interlocking Pavers or concrete sealer please call us and we can answer your questions and provide you with a quote.